Personal photos taken in Jerusalem of March 2017. 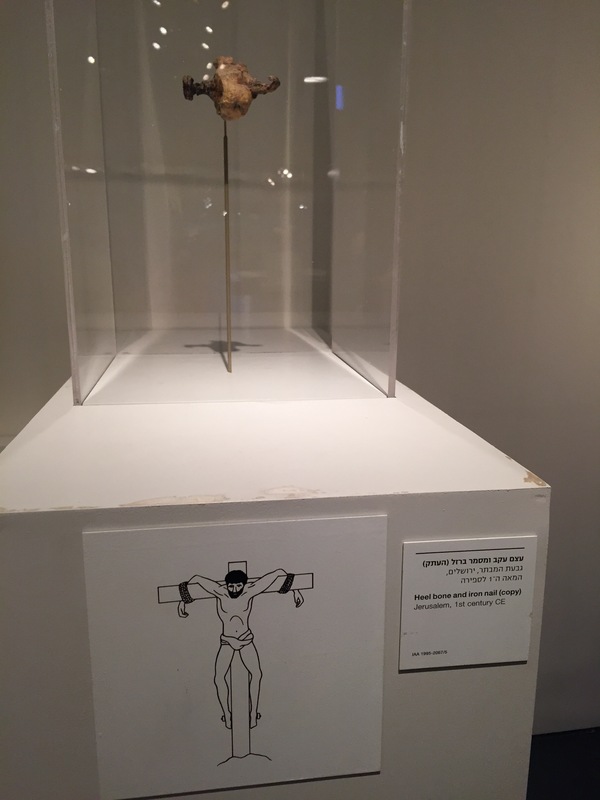 Below photo: from a Historical Museum picture of a heel-bone from a Crucifixion. As Jesus began his most personal and profound prayer, knowing of the betrayal and agony set before Him as an intense physical, emotional and spiritual battle was at hand, He prayed. He prayed inviting others to join him. We know Jesus prayed: constantly– day, night, alone, with others, before working miracles. We read here He kept returning three-times to pray. His prayer was not repetitious, but continual. Jesus prayed out of a deep and honoring love relationship calling God “Father.” We are commanded to do the same in Matt 6:9. Prayer is not always smooth, as it requires focus especially when experiencing intense emotions, physical pain, and spiritual warfare. It requires more from us when we seemingly are at our weakest. When we come before Him, with humility, at the foot of the cross, we can ask for strength to aid us, in the will of the Lord. Jesus knew the power of temptation: He shares of His own distress and grieved soul. Actively = deliberate, positive, energetic, vigorous way. Watching = give strict attention to, be cautions, active. Praying = to offer prayers, to pray. Pray, dear one, pray to your Father…..
Gethsemane is where He died; the cross is only the evidence. When a man really gives up trying to make something out of himself – a saint, or a converted sinner, or a churchman (a so-called clerical somebody), a righteous or unrighteous man,…and throws himself into the arms of God…then he wakes with Christ in Gethsemane. That is faith, that is metanoia and it is thus that he becomes a man and Christian. Jesus defeated satan in Gethsemane on the cross, not by directly confronting the devil, but by fulfilling the destiny to which He had been called. The greatest battle that was ever won was accomplished by the apparent death of the victor, without even a word of rebuke to His adversary! 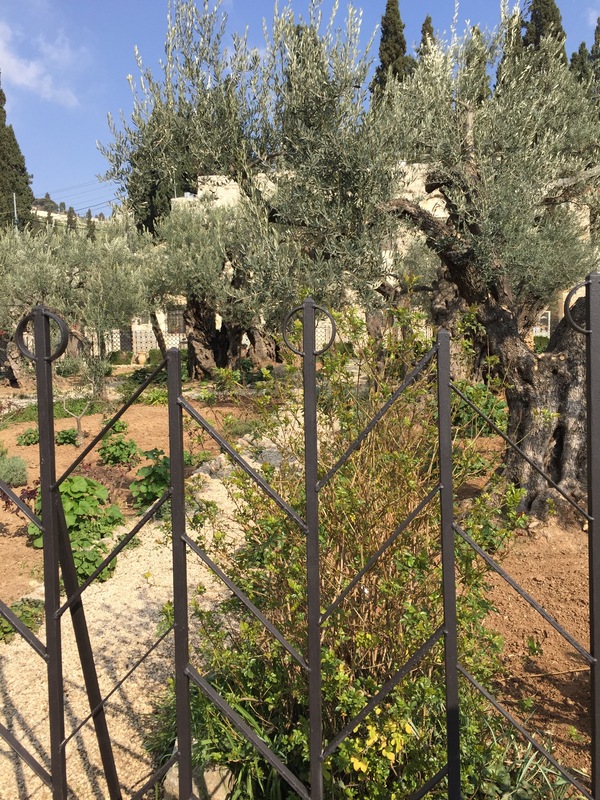 This is the centre of the gospel – this is what the Garden of Gethsemane and Good Friday are all about – that God has done astonishing and costly things to draw us near. How difficult it appears to be for the Church to understand that the whole scheme of redemption depends upon men of prayers The work of our Lord, while here on the earth, as well of the Apostle Paul was, by teaching and example, to develop men of prayer, to whom the future of the Church should be committed. How strange that instead of learning this simple and all important lesson, the modern Church has largely overlooked it. We have need to turn afresh to that wondrous Leader of spiritual Israel, our Lord Jesus Christ, who by example and precept enjoins us to prayer and to the great Apostle to the Gentiles, who by virtue of his praying habits and prayer lessons is a model and an example to God’s people in every age and clime. Posted in Unfolded Hearts and tagged Christ, Christianity, cruxifixction, easter, faith, Family, Good Friday, Holy Spirit, hope, Jesus Christ, love, prayer, Prophetic Prayer, Religion & Spirituality, source of love, trust, WordPress, WordPress.com, Writing. Bookmark the permalink. This is David, pictured above. 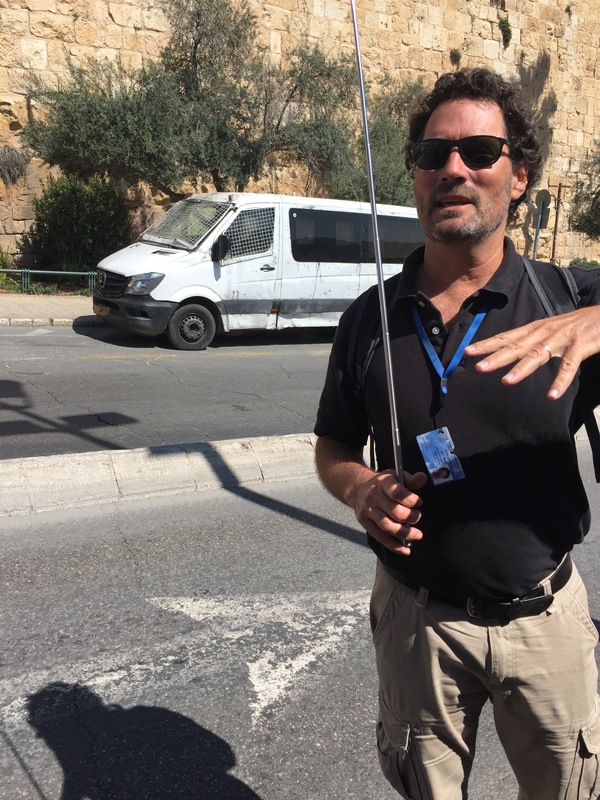 He was our Tour Guide during our recent 10 day trip to Israel. As we were traveling on foot from one site to the next, David suddenly stopped us on the side of the road. He began to explain that the battered bus pictured, is used to pick up the Jewish children every day for school; yet others in their surrounding area yell and throw rocks at them. He went on to say, this doesn’t stop the children or affect them from accomplishing their rightful place in the land and receiving an education. This picture has become a notable moment in my walk in the Holy Land. At our return the Lord etched this experience of courage by solidifying it in my spirit through His Word. Let me explain: during a study I was completing by Stephen De Silva, it lead me directly to the words of Paul in Acts 20:22-24: And see, now I go bound in the spirit to Jerusalem, not knowing the things that will happen to me there, except that the Holy Spirit testifies in every city, saying that chains and tribulations await me. But none of these things move me; nor do I count my life dear to myself, so that I may finish my race with joy, and the ministry which I received from the Lord Jesus, to testify to the gospel of the grace of God. The profound question De Silva was asking in his study is, “What are you bound to?” Could you answer that? He further went on to say: whatever we are bound to, is where we will find our strength to persevere in the face of the enemy’s schemes. And we know, the enemy has schemes and sabotages, that often times sound like, toil, fear, or threats yet our God has a remedy, Courage. Be strong and brave, and don’t tremble in fear of them, because the Eternal your God is going with you. He’ll never fail you or abandon you! Posted in Unfolded Hearts and tagged attitudes, behavior, Christianity, courage, equipping, faith, Family, God, Holy Spirit, hope, inspired, love, peace, prayer, Prophetic Prayer, Religion & Spirituality, WordPress.com, Writing. Bookmark the permalink. In as few of my own words as I possibly can share I want to say the Lord impressed upon my mind a word He gave me serval years ago, which at the time ministered directly to my heart. It came to me through a vision, regarding forgiveness. The Lord is merciful and gracious, Slow to anger and abounding in compassion and lovingkindness. I began to approach the bank of the river, my feet perfectly aligned with the edge. As I held this cup in my hand, I slowly leaned forward and looked to my left and then to my right down the river bank and as I did, I could see countless people lined up in the same fashion as I, as far as my eye could see, as well as across the river. It was time to pour out our sins into the river. As I began to pour out my sins from the cup into the river- I noticed each of my sins became the letters that spelled my sin as they were being poured out. As each letter hit the “bloods river” it began to dissolve like ink. Then I saw the ink stained letters mix together with the other saints sins that were being poured out too. Suddenly, the blood current swiftly rolled over the ink stained sins and removed them down the rivers stream, to be seen no more, forgotten forever. The second time the Lord gave me this vision it was the same as above with the exception of the cup. In this cup, He asked me to fill it with the offenses I had received. I remember feeling somewhat shameful as I made my list but more so that I allowed the offense to weigh me down. In your own words, pray through your own sins and any offenses; give them to your Heavenly Father. He knows you the best and loves you the most! Distress that drives us to God does that. It turns us around. It gets us back in the way of salvation. We never regret that kind of pain. But those who let distress drive them away from God, are full of regrets, end up on a deathbed of regrets. Posted in Unfolded Hearts and tagged Bible, care and love, communication, Emotion, forgive, forgiven, good sense, Holy Spirit, light, love, peace, prayer, Religion & Spirituality, resolve, WordPress.com. Bookmark the permalink. The third day, our Lord Jesus arose- triumphant over death, hell and the grave-and carried His own precious blood into the Heavenly Holy of Holies where it was accepted for you, me, our families and generations to come. I love how this one verse in Hebrews 12:2 starts with encouragement that enfolds us, you and I, in the assurance of Christ. The perfecting of faith is a part of our maturing. The word focus by definition is the center of interest or activity; focusing our eyes on Jesus is strategic victory for our completion [the will & purposes] as we follow a divine and supreme example. Do you have promises from God that seem too incredible to fulfill? Hear the integrity of His own heart in this verse. Posted in Unfolded Hearts and tagged Bible, Christ, Christianity, determined, effort, faith, God, Good Friday, guidance, Holy Spirit, hope, joy, love, overcome, peace, prayer, promise, Religion & Spirituality, WordPress. Bookmark the permalink. Jeremiah 31:3 says, “The LORD has appeared of old to me, saying: ‘Yes, I have loved you with an everlasting love; therefore with loving-kindness I have drawn you. '” The Lord’s love is everlasting. In 1 John 4:7 we read, “God is love.” We cannot separate the two. Therefore, before creation was spoken into existence, love was present. Before it was know or seen, His love existed. Even before you or I existed, His love was present, and directed with regard concerning each of us. Matthew 18:20 says, “Whenever two or three are gathering in his name, he is in the midst of them.” He is in the midst of us, even now, friends. Hebrews 13:3 declares. “I will never leave you or forsake you” His love will forever remain; He has willed and continues to love you with His everlasting love. Selah, pause. His heart yearns to be ministered to by our love. In all of His creation, we are the only creatures who can express our love back to Him. Action: Take the time today and express your gratitude to God for the love He has lavished upon you! This passage from John indicates the relationship of the Father’s love to the work of Christ and of both to the life of believers. John, Jesus’ beloved, is the same disciple who wrote the 4th Gospel, as well as the Epistles of 1 John. The first Epistle of John relates to fellowship and faith as John was writing, looking back, giving an account of his daily fellowship with Jesus. It’s an account with a distinctive quality worth meditating on as well as to gain an understanding of love. John’s writings provide one third of the references to love in the bible. In 1 Corinthians 13, Paul describes love as a “more excellent way” than tongues or even preaching. Wow- love above preaching. We don’t even have to leave our homes to practice the highest regard of the gospel. Paul uses the greek word “agape” to describe love in this verse meaning charity, affection, and good will. This is a sacrificial expression that is voluntary in nature, yet it becomes supreme as we weigh the price of Christ’s divine sacrifice. When we learn more of love we learn more of God. We cannot separate the two. Listen: set aside time daily without distractions and look eye to eye when speaking. Communicate: (a) Don’t make another guess what you are thinking or feeling. (b) Verbally express your love (women like to hear it). (c) Shamelessly brag of her/his good qualities. Learn to Forgive: forgiveness is at the heart of the gospel and the heart of every meaningful relationship. Past, present, and future. Honor Wishes and Take Advice: giving weight to wishes and advice shows importance and priority. Emphasize Good Points: focus on qualities you most admire. Learn to be: Thankful and Content. Smile: it creates contagious happiness. Posted in Unfolded Hearts and tagged authentic, care and love, Christ, Emotion, faith, Family, genuine love, gift of love, Lord, love, relationships, Religion & Spirituality, respect, source of love, ture love, valentine, women in bible, WordPress.com, Writing. Bookmark the permalink.